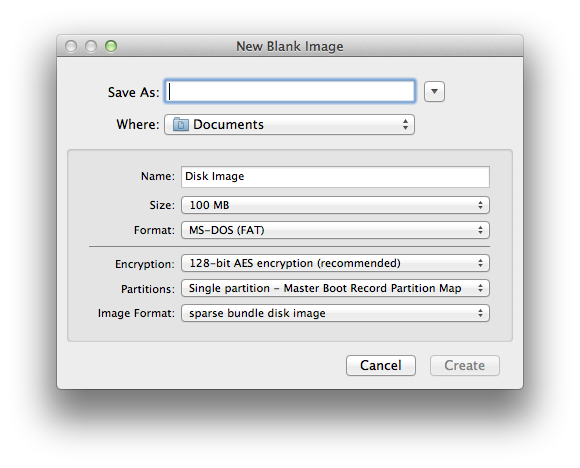 Do OS X Lion's Versions and Resume features store the cached data for encrypted .sparsebundle images in a secure way? I store sensitive information on my laptop in encrypted .sparsebundle images which are made with apps like Disk Utility, Knox and Espionage. The question is, if I upgrade to Lion, when I'm working on a file located in one of these mounted disk images and Lion is saving older versions of the file, are these older versions stored within the encrypted image (as they should be) or somewhere else? If the versions are stored somewhere else, are they encrypted or not? I've done some testing, and can offer a (hopefully) authoritative answer. Short answer: the versions are stored on the same disk (or disk image) as the actual file, so versions shouldn't leak information outside of your encrypted image. But there might be another leak, see below. For info on the sqlite index and the background daemon that mediates access to it, read John Siracusa's excellent review at ars technica. BTW, permissions on the version files seem to be cloned from the original files. Permissions on the enclosing folders tend to allow execute only (i.e. you can't see the filenames, but if you know the file's name you can access it). For example PerUID/501 is set to allow execute only for user 501, no access for anyone else. The db-v1 folder only allows root access. Without investigating in detail, it seems to be pretty locked-down. Now, about that other leak I threatened you with: Lion apps tend to save their state when you quit, so if you have a confidential document open when you quit, some of its information (like I think a screenshot) may get stored in ~/Library/Saved Application State/someappid.savedState. As long as you close before saving I think you're safe here. An excellent question from Phil M! file systems support for permanent version storage. Locally there might be some related data at /.DocumentRevisions-V100 but in this case, the versions of the remote file are local, and not limited to the root user. See for example screenshot 001 at http://www.wuala.com/grahamperrin/public/2011/07/25/e/?mode=gallery demonstrating the local versions of the remote file, opened after disconnecting from the file server. However: someone should test to see whether unencrypted versions remain within the user's home directory — which may be unencrypted — after a volume such as that is unmounted. Personally, I find fseventer most useful in test situations such as this. YMMV. Some of this answer may raise questions that are not specific to encryption, not specific to sparse bundle disk images, not specific to security. These are potentially complex subjects so please: rather than ask questions in comments beneath this answer, I should probably encourage each question to be asked separately. I checked Apple's Developer documentation on the versions feature and it seems to indicate that the previous versions of a document are stored in the same “place” (meaning either the same file, or the same folder) as the current version of the document; but the documentation is scant on details. Unlike Time Machine, Versions appends all the change snapshots within the local document file, avoiding a file system mess and the need to access backups from a Time Capsule or other external disk just to revert back to previous Versions created in the last several hours. I have not yet found any more detailed descriptions of how the Versions feature works. Gordon, this is good news for everyone, as well as the software developers for Knox and Espionage (I use both of these apps). Here's a scenario that users should watch out for though. If you're accessing a file within a mounted encrypted disk image on an external drive, the version files will probably exist on the user's System drive in an unencrypted form. One workaround for this would be to copy the .sparsebundle to the system drive before mounting it. Another scenario is if the .sparsebundle is on another Snow Leopard Mac on the same network and the image is shared on the network, enabling mounting on a Lion Mac by browsing to it through the Finder. (I do this sometimes.) This would definitely result in any version files being put on the user's System disk in unencrypted form. One workaround for this would be to use screen sharing to control the Snow Leopard Mac, then mount and work in the image on that Mac. The bottom line is that in Lion, people need to understand more and be more careful than ever when using encrypted disk images if the images are not located on the System drive. I hope the Knox and Espionage developers will warn their customers about these issues. EDIT: Graham's answer seems to support most of my assumptions. Not the answer you're looking for? Browse other questions tagged lion sparsebundle versions . Where are OS X document versions stored? Are they secure? How can I share all document revisions with another Mac? How can I email a document from iWork without the recipient seeing the intermediate saved versions? Where are the default (system) wallpaper folders located on OS X?